British tailor Richard James has reintroduced Richard James Savile Row, his 2003 fragrance for men. Our acclaimed Richard James Savile Row eau de toilette is back! Same scent, same weighty, teasingly tactile dimpled bottle. A truly masculine, seductive fragrance, Richard James Savile Row's fresh floral burst is anchored with warm, rich undertones of precious leather. The uniquely high quantity of tuberose combines beautifully with the soft suede accord to give this beguilingly feminine flower a sensual masculine twist. Richard James Savile Row was developed by perfumer Yves Cassar; additional notes include bergamot, mandarin, ginger, green tea, petitgrain, rosemary, basil, cardamon, coriander, muguet, rose, lavender, patchouli, sandalwood, tobacco, amber, vetiver, musk and oak moss. 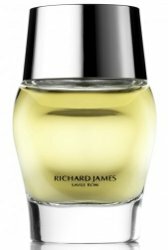 Richard James Savile Row is available in 50 and 100 ml, and can be found now at the Richard James website or at Colette in France. The ad copy is refreshingly free of B.S. I found this to be too stuffy/formal when I had it. Rarely wore it and eventually sold it. It wasn’t bad; the tuberose was an interesting choice that gave it a slight vibe of Floris Elite but not anywhere near as dense. Gosh, I’d love to smell this!